Blackberry running out of juice? June 18, 2009 by lfllmg · Comments Off on Blackberry running out of juice? Research in Motion, responsible for those of us “thumb-typing” all day long and undoubtedly king of the smart phone market announced quarterly results today. Impressive!! They beat analyst estimates again. Yet, the stock traded at some point after hours almost 10% below yesterday’s close (it has then recovered all but the last 2% or so). Is the Blackberry is running out of juice (I hate puns!) at last? People buy things because of the things these things do (whaaat?). Applications are what sell devices, not the devices themselves. Sure a sexier iPhone will sell better than an ugly one but first and foremost you have to want to do what the iPhone does before you consider it. The battle for the Smart Phone is on! The industry seems desperate to find an alternative to the iPhone so far with no success. Palm (the inventor of the category in a way) launched last week the “pre” a successor to the “pro” (pretty creative naming) that is supposed to be what we’re all been waiting for. Based on what Palm calls WebOS (do not try to pronounce it in Spanish) which is really a WebKit browser on top of a Linux kernel. It is to me just another “clever phone”, pretty well designed, but just a follow up. The phone looks promising with a full touch screen, a sliding qwerty keyboard, a well thought out user interface and a great webkit browser. It is really an adequate challenger to the iPhone’s kingdom. The problem is the partner carrier. Sprint has been losing customers since the Nextel acquisition (at the tune of 300K/month at some point!) that did not go well at all. It has the worst coverage in the US and the least amount of international carrier partnerships. It has put all its eggs in the 4G JV with Clearwire and has not invested enough in the mundane 3 or 3.5G. If it wasn’t enough, the Pre is built on the CDMA technology, which is great, but very few carriers in the world support it. One will hope they thought about it and they are cranking an HSPA version as we speak for AT&T and most of the world. Better yet, a dual mode (like the Blackberry Storm) that supports both technologies in the same device. But for the Pre to stand a chance, it needs to find other carriers pronto. The battle for the smart phone kingdom currently dominated by Research in Motion (aka RIM) the creator of the Blackberry with the most successful lineup in the industry that seems to yet unchallenged (yeah even by the iPhone). The interesting thing is that Windows Mobile (WM), the first mobile OS with (sort of) a real mobile browser after WEP is falling behind, way, way behind. 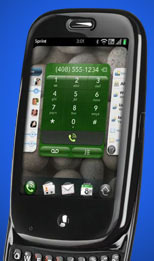 LG, Motorola, Samsung, HTC, and others serve up WM phone of varying success but no where near what RIM has been able to accomplish. When in 2006 there were twice as many WM phones shipped than any other smart phone. Now, there is still the battle of the App Stores where Apple has an apparently unbeatable lead. Palm has not announced its store yet (as RIM has) but the Pre is iTunes compatible…weird thing. Is it a play for the true alternative to the iPhone or is it something else like someone getting ready to buy Palm? Who knows. But in any case, Nokia failed miserably with its store, RIM’s success is yet to be seen, and Windows’ App store, well …, will be Windows: late and not so impressive. This battle brings memories of the glorious days of the RAZR, where everybody had one but Moto still sold 100M phones until it fell off a cliff with no true follow up. Will the iPhone follow the same fate? and the Pre, HTC-magic, G2, Moto-Q, STORM, Dare, and all sorts of weird unimaginative names – all probably registered trademarks – being the “me too’s” will also fall into oblivion soon? Check out a great comparison here. A real mobile internet is what is needed. Check my other post What’s next after the iPhone and tell me what you think. What's next after the iPhone? We all have seen the success of the iPhone, what it has done to AT&T, and how it has changed the way we look at our phones. Blackberry maker RIM, Nokia, Motorola, HTC, LG, Samsung, and others have touch phones (the last three mostly with Windows Mobile or Android) that arguably perform similar functions. App store clones are popping up like there is no tomorrow, carriers are warming up to WiFi, GPS is now a standard feature, and web browsing on a phone is a no-brainer. We can’t help but question what’s next? The problem with technology that took the industry by surprise is that it is very tough to follow. Sure there is a 3.0 upgrade in store for the iPhone but it is evolutionary at best. We all heard the potential improvements (a real keyboard, the ability to run multiple apps, a replaceable battery for crying out loud! etc.) but no analyst or company has come up with the next best thing. A truly smart smartphone is what’s missing.